Left frame is a test tower, built and tested about a week before the 2019 Maine State Tournament. 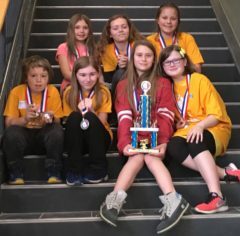 The right frame is at the 2019 Maine State Tournament. Yes, the tower is “hidden/blurred”. 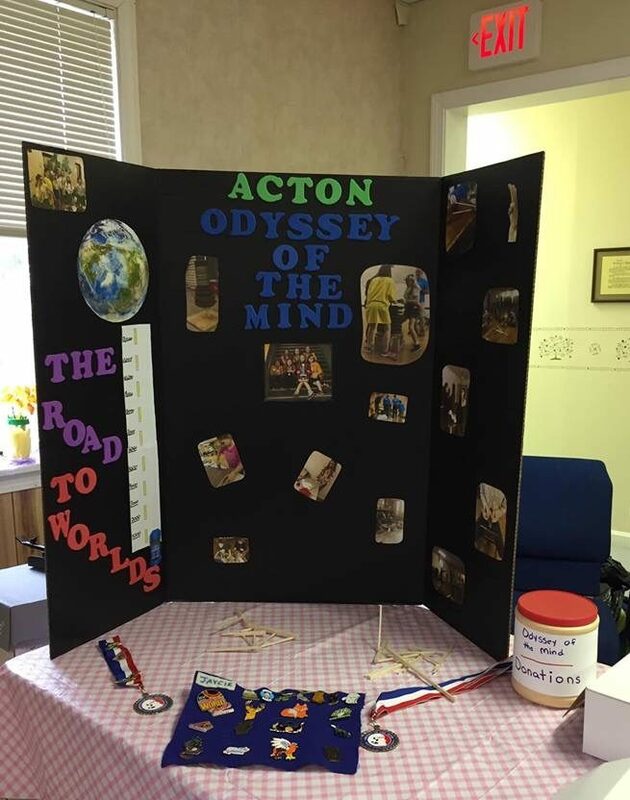 Since this Acton team selected Odyssey of the Mind’s Problem 4, the structure problem, the team has been on a path of evolution to conquering the skills necessary to score well at the OM Tournaments. Although some of the team members have changed over the years and they’ve had frustrations along the way they have still stuck with this problem for the last 3 years. One of the things they’ve learned is building the test towers is important to test different designs to see which is the best, but the “sad” truth is a successful structure design always ends the same way – the “demise” of the 14.x gram structure as it gets crushed by hundreds of pounds of weight. 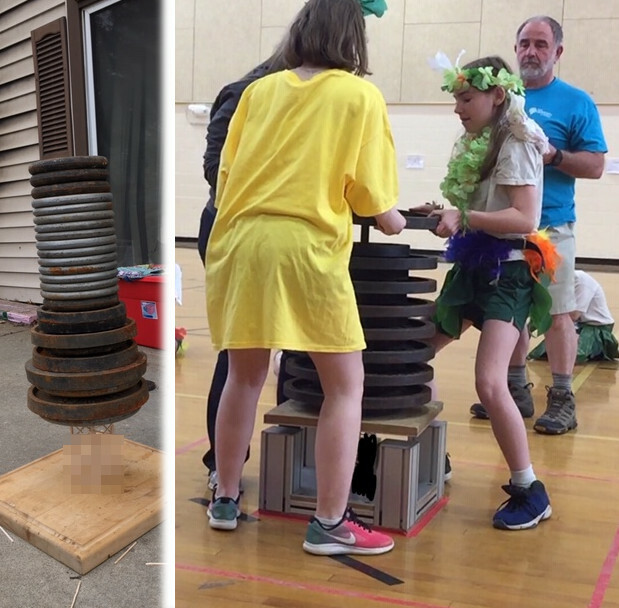 So before they even get to World Competition they have had to build several test structures and at least two competitive ones, one for the Regional tournament and one for the State tournament using lessons learned. The ability to rebuild the latest successful design is key. This “toss” requirement adds a new depth to the challenge, but so far so good! The structure held 585 lbs at the Maine State Tournament, the most weight held by any team in Maine, including the high school teams. 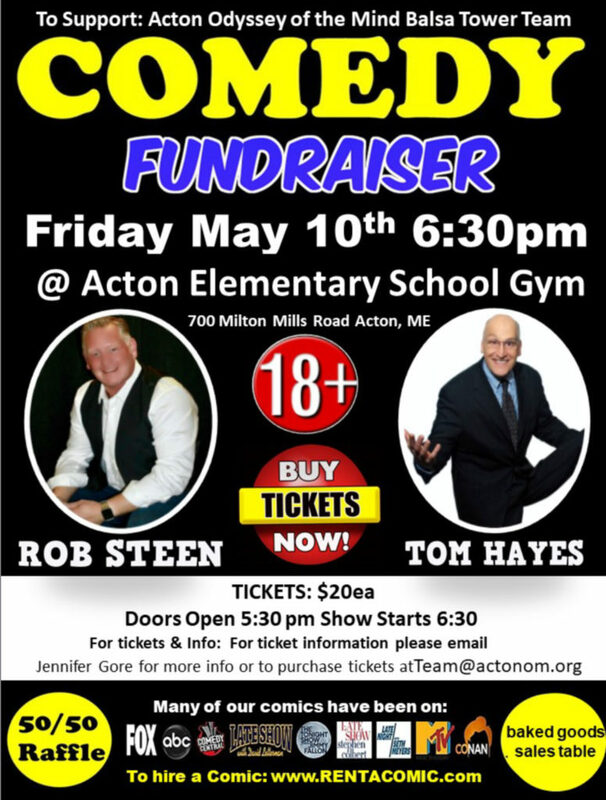 Please help us get to the World Tournament to show what a small town in Maine can do! 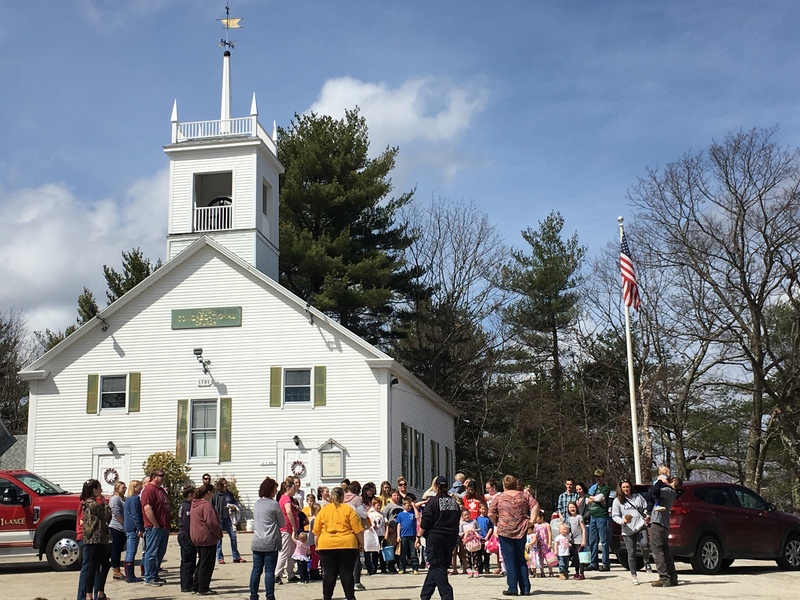 The team had success with doughnut sales on Saturday, April 13 at Town Hall and Sunday, April 14 at the church by Town Hall. The team brought in $411.00 in doughnut sales and $85.00 in donations. THANK YOU to everyone who contributed! All seven team members are participating. They will be staying (locked in) at the school for up to 24 hours. They are each allowed to bring one friend as long as the friend also seeks and obtains pledges. Pledge an hourly amount for a team member, team member’s friend, both or all! 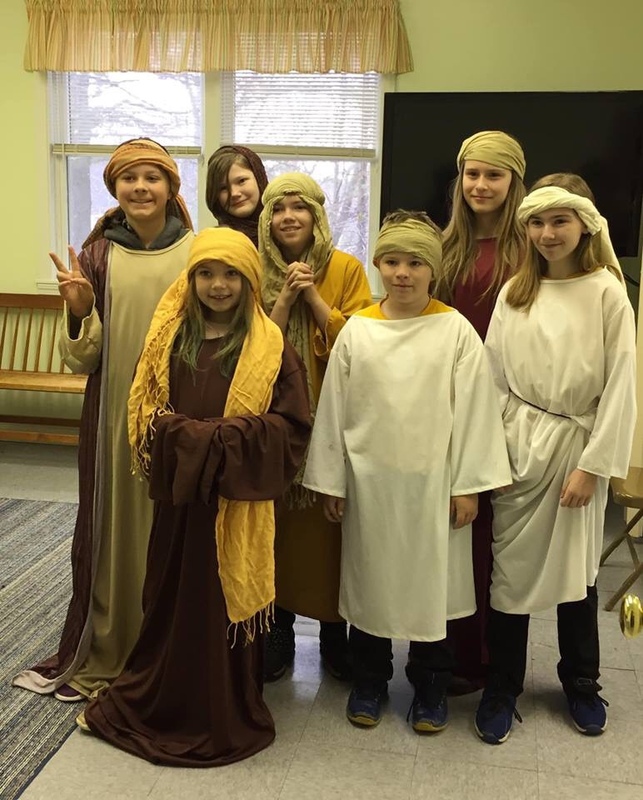 For example, for a pledge of $1.00 per hour, the total amount would be $24.00 for each person sponsored, assuming they stay for the full 24 hours. The amount (per hour) you would like to pledge. 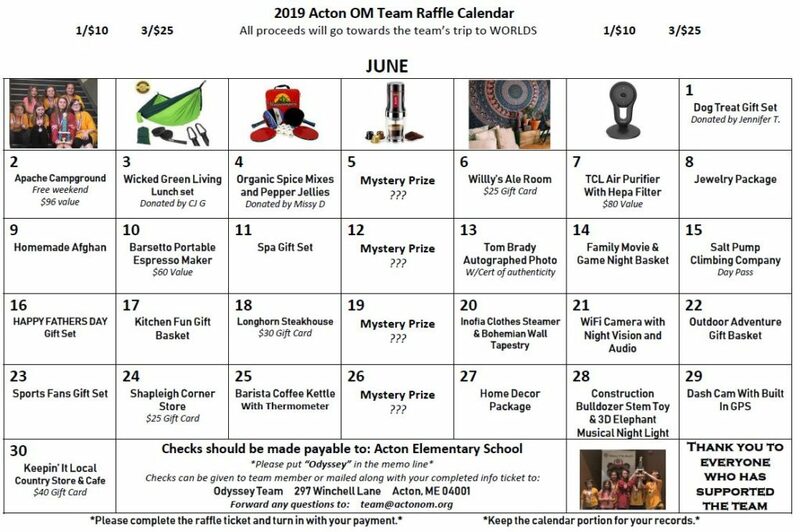 Of course if you don’t want to pledge but want to make a donation you can do that via GoFundMe, cash at one of our upcoming events or sending a check to school with “Acton OM” in the memo field.